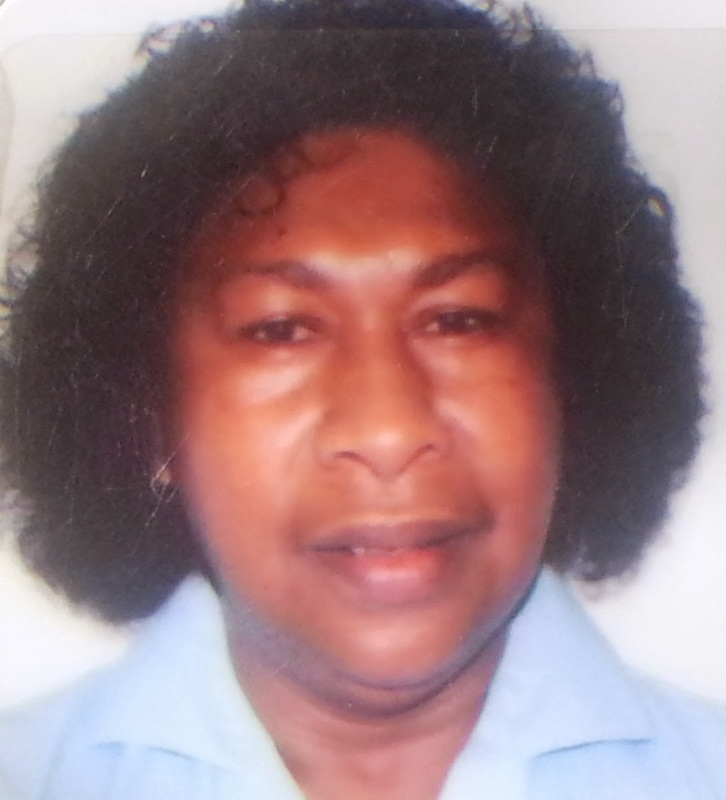 Family and friends of ALISON NALU, wife of GOROMP NAWATZ , mother of TONY and LEPUNG and grandmother of STEVEN, are advised of her sudden death in Lae on Friday, Feb 7, 2014, after a sudden stroke. Haus krai is at the family residence at Butibam village, Lae. Funeral service will be at St Andrew’s Lutheran Church, Ampo, on Thursday, Feb 13, 2014, starting at 12pm followed by her burial at Butibam Village Cemetery. Further information can be obtained from DAVID NALU on 71908604 or LEPUNG NALU on 70313333. MAJURO, Marshall Islands — A long-serving Papua New Guinea fisheries chief who is expected to step down this week was recognised Wednesday for “transforming fisheries” in his country and for his regional advocacy on behalf of island nations’ fishing interests. Sylvester Pokajam, managing director of PNG’s National Fisheries Authority or NFA, is being replaced by deputy John Kasu in a move by the government’s cabinet, according to reports. 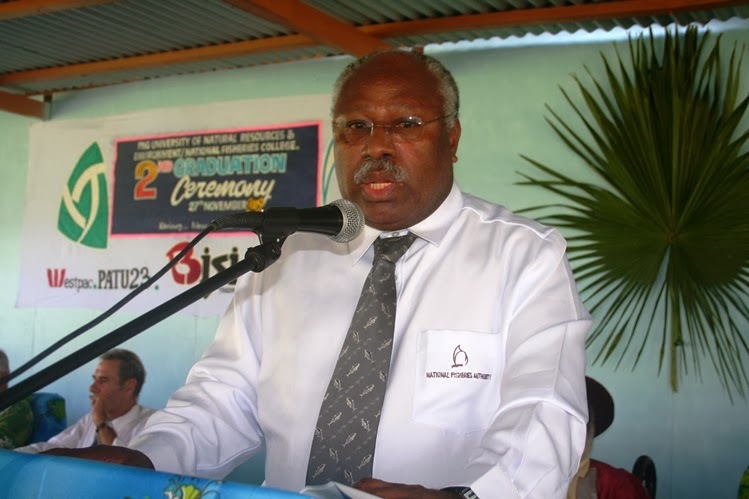 Pokajam during his term as PNG fisheries chief. Pokajam has headed PNG’s fisheries office during a time of unprecedented expansion of domestic fish processing plants and played a key role in the development of the Parties to the Nauru Agreement or PNA fisheries bloc. He is reportedly the longest serving head of a government department, having held the NFA post for about 10 years through several governments. “He ran a good organisation, which is reflected in the huge fisheries investments in PNG,” said Dr. Transform Aqorau on Wednesday. Aqorau, who is from the Solomon Islands, has worked in national fisheries in the Solomons, for the Forum Fisheries Agency and in recent years for PNA. “When I started in fisheries, there were no on-shore investments in PNG,” he said. But PNG now leverages the issuance of fishing licenses with investment requirements for distant water fishing nations. “He created an environment encouraging on-shore investments,” said Aqorau. But Pokajam was also keenly focused on fisheries work in the region, and put up NFA money to support regional stock assessments. Pokajam’s departure “will leave a big gap in the region,” said colleague Maurice Brownjohn, a founding member of the NFA board established in 1995 who continues on that board while currently working as commercial manager for the PNA, based in Majuro. Prominent lawyer, author and former diplomat Peter Donigi died of a heart attack at Port Moresby General Hospital last Thursday morning. 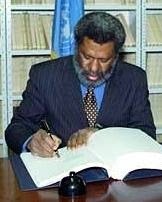 Donigi, 63, from Wale Lowan village along the West Coast of East Sepik, served Papua New Guinea with distinction as a lawyer and senior diplomat with postings in Germany, and PNG’s Permanent Representative at the United Nations in New York accredited to the Holy See. He is survived by wife Diana and six daughters Stephanie, Amanda, Yasmine, Caitlin, Davita and Loretta. Donigi was one of the first batch of graduates from the Legal Training Institute in 1973 and served as deputy secretary for Foreign Affairs and Trade under Sir Anthony Siaguru in 1975, before becoming a diplomat. He previously taught at University of PNG, specialising in constitutional law. Donigi was lead counsel of Opposition Leader Belden Namah’s legal team at the time of his death. Namah described him as “a great man who brings out the best in people with his genuine humbleness and achievements as a constitutional lawyer and diplomat”. “The nation has lost one of its greats. “He is a great loss to us (Opposition) and the country. A women’s group in Lorengau will hold sewing classes and create clothes and handicrafts for sale after receiving 20 electric sewing machines from Australia’s High Commissioner to PNG, Ms Deborah Stokes. Ms Stokes last Thursday officially handed over the machines to the Pihi Lorengau Women’s Group during a visit to Manus Province. Australian High Commissioner HE Ms Deborah Stokes with members of the Pihi Lorengau Women's Group during the presentation of the 20 sewing machines. Australian High Commissioner Ms Deborah Stokes presenting a sewing machine to Pihi Lorengau Women Group Representative Ana in Manus. “I am delighted to provide the women of Manus with more opportunities to enhance their sewing and business skills, display their talent and generate income,” Ms Stokes said. Empowering women and girls to enable them to reach their full potential and enjoy equal opportunities is crucial for the future prosperity and viability of this country. “The Pihi Lorengau Women’s Group are deserving recipients of these machines through Australia’s Direct Aid Program. “I look forward to seeing exhibitions and sales of unique and wonderful Manusian clothes and crafts to boost tourism and contribute to the Manus Provincial Government’s Medium Term Integrated Development Plan. Sewing classes and exhibitions are to be held at the Provincial Women’s Conference Centre. The Direct Aid Program is a flexible small grants program funded by the Australian Government to advance developmental objectives and address humanitarian hardship. The program is available on a not-for-profit basis to individuals, community groups, non-government organisations and other entities engaged in development activities. The program focuses on supporting small-scale development projects and activities that involve the beneficiaries in the identification, design and management of the projects. Australia and the Manus Provincial Government are inviting key stakeholders in Manus to have their say about the renovation of the Lorengau main market roof. A market Vendor putting a plastic canvas as cover. Centre view of the Lorengau Market with timber shingles rotten. Left Wing of the Lorengau Market with cracked roofing. The Australian Government and Manus Provincial and Technical Services Division invited key stakeholders to a consultation session at Sapau Haus, at 9am on Friday 31 January. Australia’s High Commissioner to PNG, Ms Deborah Stokes, who inspected the market on Thursday, said the market will be renovated for the Manus people and be a market Manusians can be proud of. The renovation is fully funded by the Australian Government and will be constructed by the Provincial Technical Services Division in close consultation with key stakeholders in Manus. “Our initial discussions with Manus leaders last December agreed on this consultation process to ensure the voices of stakeholders are heard in the planning of this vital infrastructure,” Ms Stokes said. After stakeholder approval of the concept design, an architect will prepare a detailed design of the roof, which is expected to be built of metal. Construction is expected to commence in July and be finished by December. The Manus Local Level Government has already demolished a dangerous, collapsed section of the roof in consultation with the Manus Provincial and Technical Services Division. Built in the late 1970s by the Manus Local Level Government, the Lorengau main market comprises eight interconnected wooden shelters over concrete slabs and market stalls. Some parts of the roof have collapsed, timber shingles are missing and some support posts are rotted and twisted. “The market is a hive of activity each day but vendors face challenging conditions with the roof no longer waterproof and collapsing in parts,” Ms Stokes said. Australia and PNG’s additional assistance to Manus includes initiatives in healthcare, education, roads and activities for youth. “Australia is providing K1 million in specialist medical equipment and instruments for Lorengau hospital and a master plan to guide future development of the hospital,” Ms Stokes said. Construction of 13 schools kits under the additional assistance package will be finished in time for the new school year. A further seven kits are expected to be built by the end of March. The Australian-funded kits include a double classroom with a teacher house, ablution block, water tanks and full furniture fit out. The projects are part of an AU$24 million (K51 million) additional development package that Australia is providing to the Manus Province. This is an addition to Australia’s existing planned support under the Partnership for Development to Manus Province (approximately AU$16 million or K34 million from 2012-15) in health, education, law and order, transport, governance, climate change, and disaster reduction. Papua New Guinea have been the feel good story of the Cricket World Cup qualifying tournament and the side's coach believes they will continue to surprise in the future. When the 10-team event began in New Zealand just under three weeks ago, PNG were expected to find the going tough and jostle for the minor placings. SPIRITS HIGH: They came from nowhere, but finished top of their pool at the Cricket World Cup qualifying tournament. The Barramundis surprised even themselves, topping their group in pool play after winning three of their four games. They were the top seed for the Super Six stage after carrying over two wins, but losses to the United Arab Emirates, Scotland and Hong Kong dented their World Cup aspirations. PNG were still able to smile, finishing fourth overall, which should lead to increased funding and potentially ODI status down the track. Over the past two years ntsG , nte PNG have improved significantly, finishing third in division two of the ICC World Cricket League and ntsG finishing nte eighth out of 16 teams at the Twenty20 World Cup qualifying tournament last November. PNG proved they belong at the T20 qualifier, beating associate cricket stronghold Ireland in a warm ntsG - nteup game and also securing victories against Kenya, the Netherlands and Namibia during the event proper. PNG's coach, former Queensland and South Australian wicketkeeper ntsG , nte Peter Anderson ntsT nte, ntsG believed nte said the side was making steady progress. Their young squad has been boosted by the addition of 37-year-old former English wicketkeeper and 2005 Ashes winner Geraint Jones ntsT nte, who was born in PNG and spent the first six years of his life in the country. Jones has played for PNG for the past two years after undergoing a four-year stand ntsG - nte down period to become eligible. He is not the only former international to be lending a hand, with former Zimbabwe legspinner and Auckland coach Paul Strang ntsT nte acting as specialist coach. Anderson said PNG's inexperience meant they often followed up a strong performance ntsG , nte with a poor one, which he had tried to address. PNG have won the past three East Asia Pacific championships, but Anderson said the only way for the team to get better was to test themselves against stronger opposition. ''We were the big bullies in the backyard and now we're on a new street and we've got bigger boys on the street. Jones said the PNG side should be proud of the way they played during the World Cup qualifying tournament in New Zealand and was excited by the potential of the squad. ''To be competing at this level is a fantastic effort, where the guys have come from and the circumstances. Interest in cricket is growing in PNG, with 70 fulltime staff now employed among six regions in the country. Jones said the ntsG sport nte game was mainly played in ntsG the capital, nte Port Moresby ntsT nte ntsG , nte and in the coastal areas. There was a schools programme operating, but there was a large dropoff once they completed their studies. ''The actual numbers we've got to choose from is quite small. They're all homegrown players. To be competing with homegrown players is outstanding.'' Jones said. Both Anderson and Jones admitted the standard of wickets in PNG was a disadvantage. PNG Cricket's major ground, Amini Park ntsT nte in Port Moresby, was undergoing an upgrade with a third grass wicket block being created. ''Yes, it is very difficult,'' Anderson said.